The Centro region of Portugal stretches from the Atlantic coast in the west to the Spanish border in the east. Although encompassing the width of the country, distances remain short and sites of interest all within close proximity. A destination in its own right, the delightful Casa da Ínsua is at the midpoint of the region thus providing easy access to impressive mountain ranges, fortified villages, Natural Parks, traditional fishing villages and sandy beaches. Within an hour’s drive the diversity, beauty and charm of Portugal can be uncovered. On arrival at Porto Airport, collect your hire car and drive to the Casa da Ínsua in Penalva do Castelo (c.1 hour 40 minutes). A welcome drink is offered, and in fine weather you can enjoy your beverage on the panoramic outdoor terrace, which affords views over the grounds of the 18th century Manor House. This evening, a complimentary 3-course meal (drinks excluded) is included at the property’s restaurant. With wine, cheese, olive oil and jams produced on site and local producers favoured by the owners, you are guaranteed to sample delicious regional cuisine. Overnight at Casa Da Insua. Day at leisure. Time to familiarise yourself with your surroundings by participating in a guided tour of the gardens and of the estate. We have also included complimentary access to the ‘Centro Museológico’ on site which displays historic artefacts from the property, and, for those who wish, a cheese or jam workshop (Serra Cheese Nov-Apr and Fruit jam May- Oct) is offered at an additional cost. The workshops discuss the processes undertaken to create the delicacies. In the afternoon, why not drive to the historical town of Viseu (25km)? Sites of interest to visit include the Misericórdia Church, the popular Grão Vasco Museum and the cathedral. There are also shops selling artisan goods and restaurants serving typical cuisine – including the cool Maria Xica restaurant. Day at leisure. Opportunity to seek out one of the 12 historical villages which line the Spanish border. Almeida, Belmonte, Castelo Mendo, Castelo Novo, Castelo Rodrigo, Idanha-a-Velha, Linhares da Beira, Marialva, Monsanto, Piódão, Sortelha e Trancoso are all unique, inviting and surrounded by imposing landscapes. Step back in time, meet local people and learn about the history of the region. Day at leisure. Day at leisure. We would recommend driving to the 33-hectare Bussaco National Park (c.1 hour drive), renowned for its array of exotic trees and species of rare flora collected from all over the world by Portuguese navigators. At the heart of the park is a 19th century palace, built for the last King of Portugal, and some delightful formal gardens. Both the palace and park make for an enjoyable half-day excursion from the Casa da Ínsua. In the afternoon, why not continue your drive towards the Atlantic coastline and visit Aveiro, known as the ‘City of the Water’ because of its canal system (c.45 minutes drive)? Take a trip on a Moliceiro boat; hire a bicycle to explore further afield, visit the Art Nouveau Museum and enjoy a tasty meal at the Praça do Peixe. After breakfast, drive to Porto airport for your return flight to the UK. For those on a late flight, why not drive north to Lamego before following the Douro River valley to Porto. Casa da Insua is an impressive 18th century baroque manor house, located in Penalva do Castelo, and which reflects the architecture and decor of a bygone era. 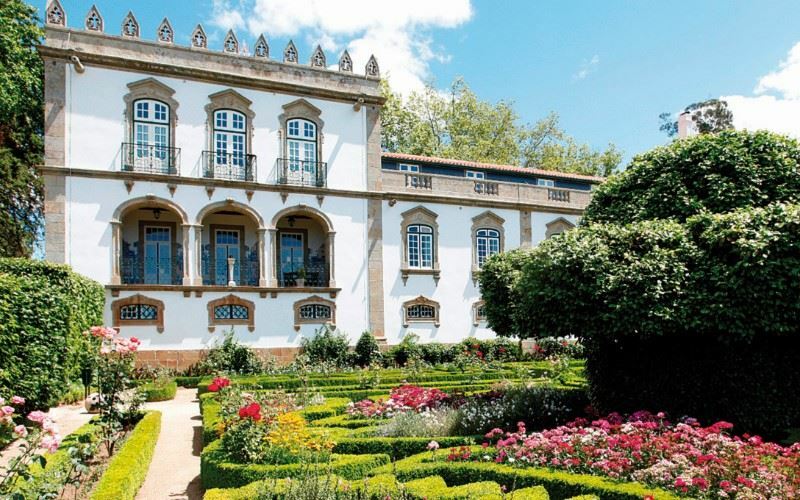 Casa da Insua is an impressive 18th century baroque manor house, located in Penalva do Castelo, and which reflects the architecture and decor of a bygone era. The guest accommodation is divided into three distinct areas: the palace, cloister and the arch wing. The property is well known for its magnificent 18th century gardens and for its production of wine, cheese, olive oil and jams. Guests are invited to take guided tours of the gardens and estate, as well as partake in wine and cheese tasting.